Olivia Beckner leads Heather Holt and Julia Ghiselli in the second mile of the 6A championship. Photo: Bruce Buckley. Lake Braddock girls won their third straight 6A title, once again beating Oakton, winner of the two state meets before the Bruins’ streak started. After three years of winning team scores in the 40s, the Bruins nearly doubled that, scoring 86 to Oakton’s 92. They did it with a tight pack of their fourth through seventh runners, who finished 31st, 32nd, 33rd, 35th and 38th. Senior Sarah Daniels led the way in sixth (19:00) and Brielle Perry in 14th in 19:28. Rebecca Doran (20:02), Zoe Rafter (20:03), Samantha Schwers (20:07), Madeline McAvoy (20:09) and Madeleine Fleenor (20:11), respectively, also raced. Daniels, Schwers and McAvoy returned from last year’s team. 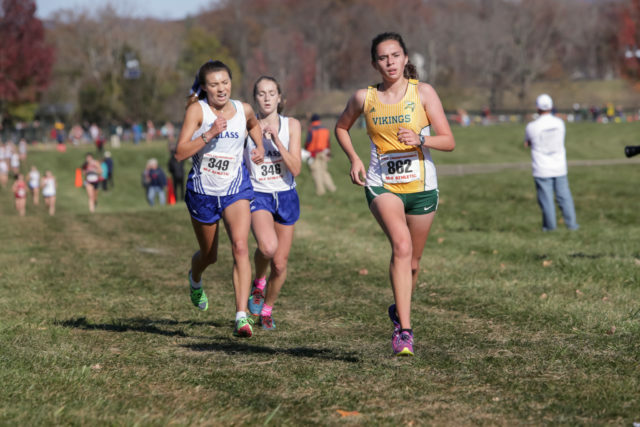 Loudoun Valley boys and Lake Braddock girls dominated their races while defending their Virginia state titles, while the James Madison boys and George Marshall girls won their first-ever championships. 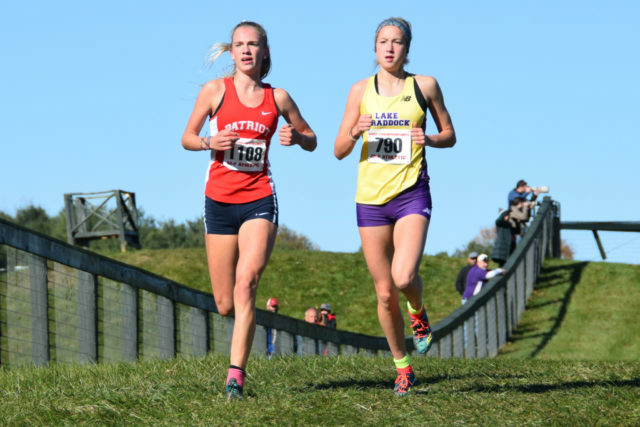 Kate Murphy broke the Great Meadows course record when she won her second straight 6A title, running 17:08 to beat Libby Davidson‘s 17:12 mark from 2014 and finish well clear of Rachel McArthur‘s 17:50 second place finish and making Lake Braddock’s team race four on five against everyone else. That’s all despite putting less emphasis on cross country, just months after competing in the U.S. Olympic Trials and world junior track championships, and not racing with the record in mind. It was going to be a grind, because McArthur was coming back to cross country after missing the 2015 postseason with a quad tear that left her unable to defend her 2014 6A title. “I couldn’t just chill because Rachel definitely wanted to race, but I think I ended up running my best cross country race of the season,” Murphy said, with the caveat that she hasn’t raced much yet, with a focus on the Nike Cross Southeast and, with any luck, national meet. The pair pulled away early as Murphy reeled McArthur in from a fast start. They came through the mile in 5:20, with a 10 second lead over Cosby sophomore Rachel Northcutt. Murphy took a slight lead through two miles in 10:56, with Northcutt nearly 30 seconds back, then gradually pulled away from McArthur before putting her away in the series of hills in the third mile. The two have committed to top collegiate distance programs — Murphy to Oregon and McArthur to Villanova and while the prospect of the pair racing tooth and nail, like the state 800 meter championship, was appealing, cross country just isn’t their priority anymore. 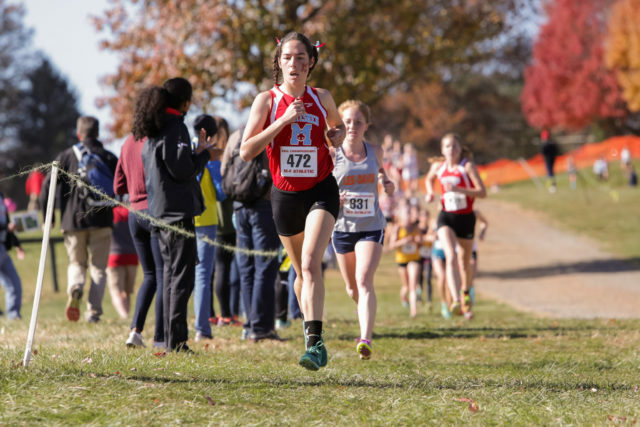 “Cross country, I still want to do well, but track’s my main focus, and I didn’t expect to run a peak performance this season,” McArthur said. Murphy said it was a matter of proportion. 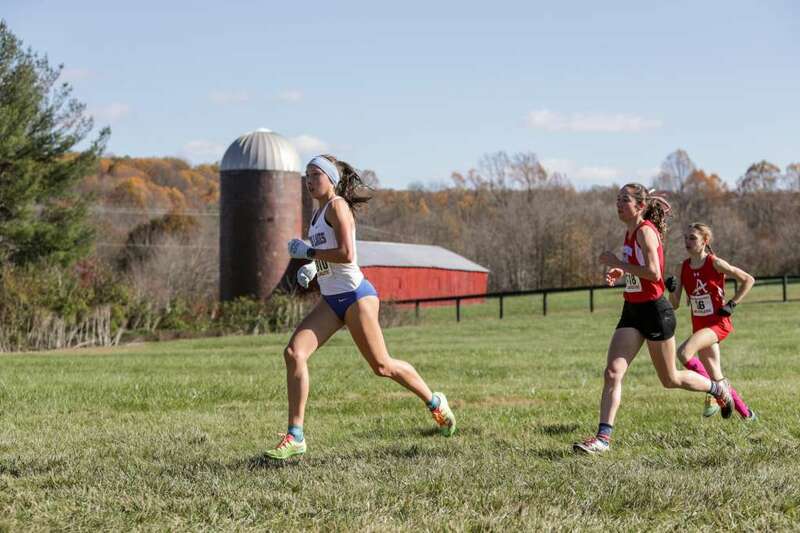 South Lakes junior Olivia Beckner was running her first state meet after two years of injuries, but she made the most of her opportunity, running 18:04 for fourth place and nearly catching Northcutt (18:01). Lake Braddock scored 46 points to outdistance Oakton’s 107, with James Madison in third with 113. West Springfield was fourth with 133 and Patriot fifth with 149, with Cosby (156) edging Chantilly (161). The Bruins had all seven runners in the top 35, with the scoring five in the top 30 overall — Sam Schwers in sixth, Taylor Kitchen in 10th, Emily Schiesl in 15th and Sarah Daniels in 29th. They’ll head to Cary, N.C. for Nike Cross Southeast in two weeks. The Bruin boys lost their bid for a third-straight 6A title when James Madison finished three points ahead, 63-66, for the Warhawks’ first title. 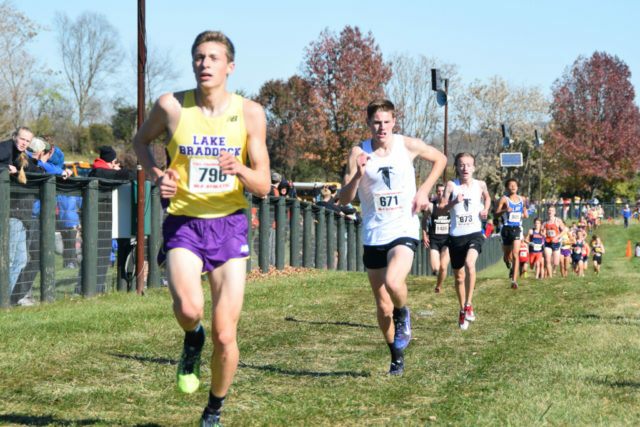 Lake Braddock was winning by the same margin at the second mile, but a strong stretch run, including senior Patrick Murphy outkicking LB’s Evan Chase, fueled the comeback. Sean Grimm (seventh overall), Zach Holden (11th), Murphy (18th), Chamberlain Zulauf (21st) and Kevin Murphy (38th) scored for Madison. It follows a win over Braddock — and Oakton — at the regional meet, which showed the Warhawks what was possible. He credited consistency among this varsity runners and the variety of challenges they faced throughout the season. The challenge, Chasse said, was to not slow down during turns and keep their effort up on the 1,000 meter finishing stretch. “It’s a tough balance on that stretch to not leave anything on the course but not run out of gas before the race is over,” he said. 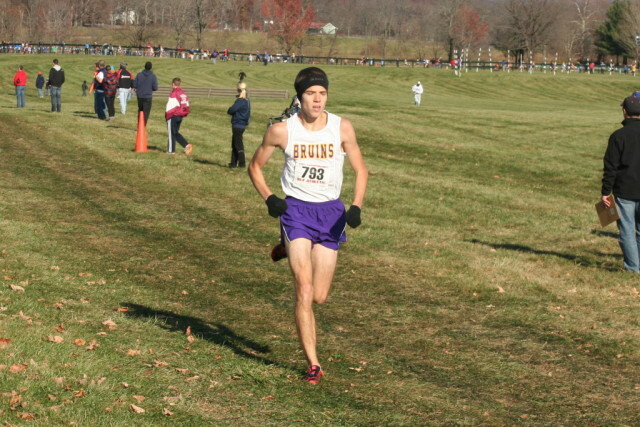 Lake Braddock’s Conor Lyons came up just a little short on that stretch, losing second place to Cox’s David Scherrer (both finished in 15:23) and within reach of winner Peter Smith of Oscar Smith High School, just a second ahead. He made up five seconds on Sherrer in the last 1.1 miles. The Northern Region teams swept the team standings, with Chantilly (118), Oakton(137), West Springfield (144) and Patriot (146) filling in third through sixth places. Chantilly senior Brandon McGorty, an 800 meter specialist heading to Stanford next fall, got out fast. He finished fourth in 15:39, one second ahead of Oakton’s Ahmed Hassan. Like the James Madison team, McGorty used a win at the regional meet to motivate him at states. 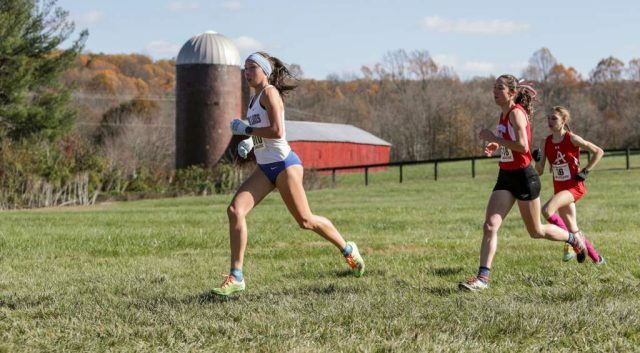 Just as in the 6A race, the 5A race featured two past winners — the 2015 winner in Tuscarora junior Emma Wolcott and George Marshall junior Heather Holt, who won as a freshman in 2014. Holt didn’t want to give anyone else a chance, so, as has been her custom this season, she took off early on and had the race to herself after the halfway point. That they didn’t, and she was able to put 22 seconds on Albemarle’s Ryann Helmers by the second mile on her way to a 29-second margin to win in 17:18. Wolcott moved up through the race to finish third in 18:01. Holt’s low scoring position helped Marshall to its first-ever team title, with 53 points, thanks to Ava Bir (ninth), Hannah Smith and Sophie Tedesco (14th and 15th) and Jenna Robbins (17th). Tuscarora trailed in second with 107 points, Broad Run was seventh with 184, Potomac Falls was one place back with 200 points and Thomas Jefferson was 10th with 226. They were sixth in their first state meet appearance in 2014 and fifth in 2015. Smith is a senior; Tedesco is a freshman. They both saw dramatic drops in their times from the Great Meadows Invitational in August. Smith said she transitioned into a more committed runner this year and credited Tedesco’s company on her upward trajectory. “I just ran to have fun before, but I didn’t realize how fast I could be,” she said. Coach Darrell General said the team running within its character was the key to its season-long success. That went both for their individual tendencies as runners and the athletes’ collective spirit. Holt said there was universal buy-in for the dedication necessary to win the state meet among her teammates. General approached it from another angle. Their male teammate Patrick Lynch ran a hard last stretch to wrest control of third place from Thomas Jefferson’s Saurav Velleleth in the 5A race, coming from two seconds back at the two mile mark. Lynch finished in 15:34, Velleleth was three seconds back. He has a lot of confidence in his kick, but the race environment injected a little adrenaline, too. Douglas Freeman senior Waleed Suliman won the race for the second year in a row in 15:13, the fastest time of the day by a second. Edison junior Yared Mekonnen also saved his strength for the end, but on a longer scale. He suffered from food poisoning on Wednesday and was in bad shape for a few days. He wound up fifth in 15:43. Tuscarora was the top local 5A team, in third with 125 points behind Deep Run (76) and Glen Allen (105). Thomas Jefferson was fifth (159), Edison edged by Lee-Davis in tie for eighth (166) and Marshall edging Hickory in a tie for 10th with 195. Four teams scored 165 or 166. Loudoun Valley’s girls finished second, for the second straight year, behind junior Natalie Morris‘ runner-up finish in 18:19, behind Liberty Christian Academy senior Noel Palmer (18:04), who was third at the Glory Days Invitational. “I tried to go with Noel when she passed Libby (Davidson) and I didn’t really stick with her long, but that got me into second place (in the second mile) and I never gave it up,” she said. The Vikings scored 88 points to trail E.C. Glass’ 36 points. Jefferson Forest (135), Rock Ridge (143) and Loudoun County (156) finished fourth through sixth. Morris’ twin brother, Peter, took top honors for the family, winning the 4A boys title in 15:14, a second off of Suliman’s time. That made Loudoun Valley’s path to a repeat that much easier, as did Colton Bogucki‘s fourth-place finish in 15:37 and Jacob Hunter‘s 15:53 sixth-place finish. Jacob Windle was 20th and Chase Dawson was 29th. The Vikings dominated with 45 points, ahead of Midlothian (90), Freedom (92) and locals Rock Ridge (seventh with 189 points), Dominion (eighth with 207) and Woodgrove (11th with 252). Loudoun Valley will also head to the Nike Cross Southeast meet. Sophomore Ryland Pettit was the first Woodgrove runner to break 16:00 — he ran 15:54 — and he ended up overshooting his goal. “I was ranked 12th, so I was shooting for 11th,” he said. He ended up seventh. He studied the runners ahead of him and any timehe saw someone falter in their stride, he went for them. “This was the best race I’ve ever had, not just because of my time, but because I was able to stay focused the whole time,” he said. But for some more fortuitous scheduling, Lake Braddock’s boys may have had “throwback Thursday” on their hands. A throwback to something none of the Bruins were alive to remember. So they settled for a #sometimeagoSaturday. But that’s all the settling they did. With an individual title by senior Alex Corbett and a dominating team victory, they put their names in the state championship history books as winners for the first time since 1987, when Brad Baker got the scoring started with one point, en route to a 48-60 win over Woodbridge. [button-red url=”http://www.runhigh.com/2014RESULTS/R111414AA.html” target=”_self” position=”left”] Results [/button-red]The Bruins had finished a close second, 87-85, to Chantilly last year, in a 6A class team competition that saw four teams separated by four points. It wasn’t even close this year at Great Meadows, as they gapped West Springfield 41-92, placing three runners in the top seven, led by Corbett and Kevin Monogue sweeping the top two spots. 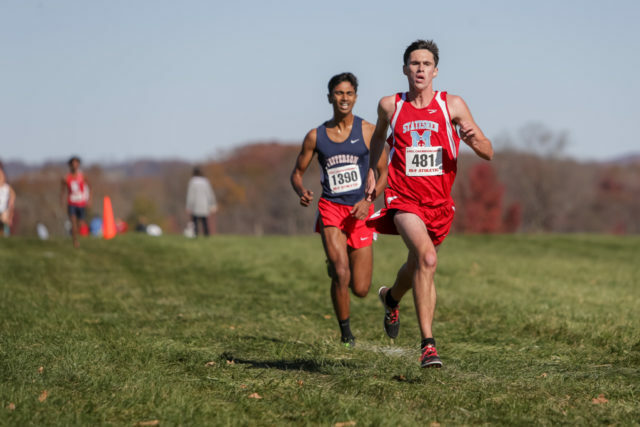 Coming in off a North Region championship and a strong senior season, with a 15:17 5k PR set in September at the DCXC Invitational, Corbett was confident his plan would play out to his liking. Chantilly’s Ryan McGorty (fourth, 15:26), T.C. Williams’ Anteneh Girma (sixth, 15:36) and Cox’s Jonathan Lomogda (third, 15:21) led the way through the mile, and a quartet of Bruins sat in wait a little bit behind. Monogue’s 15:19 was a PR, and put him five seconds ahead of Stoney’s winning time last year. In 2013, Monogue ran 16:16 for 31st place, so that was a bit of an understatement. When Schaefer moved to Northern Virginia from Nevada over the summer and joined the Bruins’ cross country team, he was introduced to a team on a mission. The Bruins will see how they stack up against the rest of the Southeast and possibly the nation when they take a shot at qualifying for the Nike Cross National meet in Oregon. Mangan is used to taking runners to the Footlocker Cross Country Championships after several successful years with now-graduated girls. “I guess I don’t get to take my December trip to San Diego this year,” he quipped. While Lake Braddock had a year to stew over their two-point loss, their pursuers had been waiting even longer for a shot at the state title. West Springfield sent a boys’ team to the state meet for the first time since 2006, and did it in style, finishing second. Led by Tim Ward’s 10th place finish in 15:56, the middle of the Spartans’ scoring pack came in places 25, 26 and 27. Coach Chris Pellegrini explained that his team, while not flashy, got the job done. 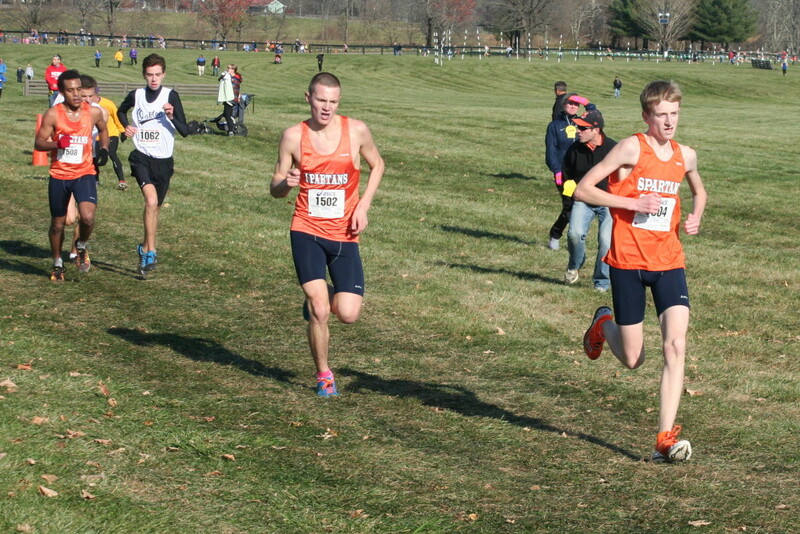 Pellegrini gave a great deal of credit to junior Andrew Lackey (27th), the only underclassman in the bunch, who was running his first season of cross country after a playing in the marching band. As Nahom Teshome (25th, 16:21)and Evan Fabish (26th, 16:22) faded in the third mile, Lackey caught them and snapped them back into the goal at hand. Lackey deferred to his teammates when he explained his motivation. He’ll be the top Spartan returner in 2015. “He’s the ‘how is he doing this, how is he running that fast’ kind of kid that a program needs to get over the top,” Pellegrini said. McGorty led Chantilly to a third-place finish, with Oakton in fourth, led by Simon Iyob (12th, 15:58) Robinson in fifth led by Patrick Myers ( 14th, 15:59) and Hunter Jurtas (15th, 15:59) and Washington-Lee in eighth, behind Patrick Odlum (43rd, 16:42). In the 5A race, Thomas Jefferson was the top local team in second, behind sophomore Saurav Velleleth‘s ninth place finish in 16:12. Heritage senior Joey Lightbody was the top local 4A runner in 34th place (16:57). 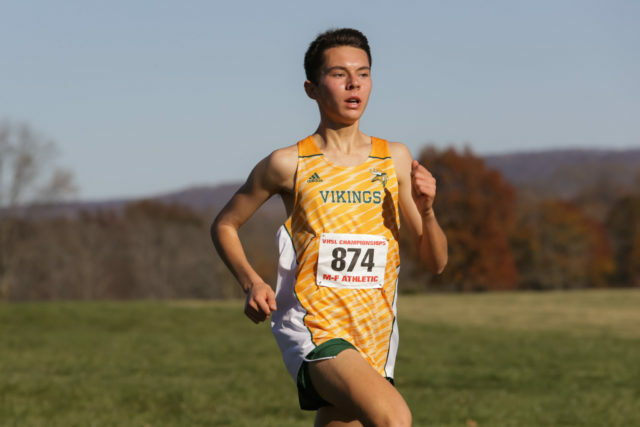 On Friday, Loudoun Valley junior Andrew Hunter broke Sean McGorty‘s two-year-old state meet record (14:47) with his 14:41, while Brentsville District took the team title behind junior Jack McNally in seventh place (16:11). McGorty went on to finish second in the 2012 Footlocker Cross Country Championships. In the 2A race, George Mason finished sixth, behind senior Jackson Jost‘s 30th place finish (17:45).